That was necessary because, for example, shots that were used to construct a sequence may have been filmed under varied light conditions or on various types or qualities of film stock. The women who posed for China Girl shots were assisting in the completion of painstaking, workaday tasks. 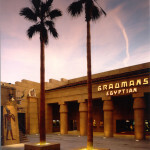 Each of the color-control images became part of one original, master print that a lab worker made from camera negative. 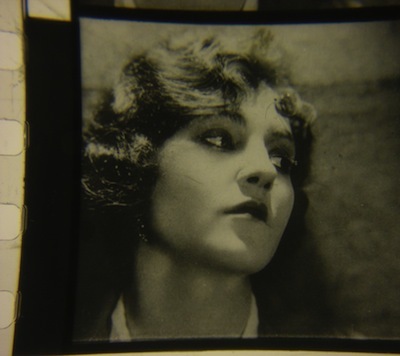 The print was then copied – as many times as necessary to meet demand for that film, worldwide – and on each reel that woman’s image went out to potentially thousands of theaters: The woman made her way from anonymous isolation in a particular film lab out into the film world, still in anonymity — because, of course, film-lab workers did not place the image on film-reel leaders for general exhibition. And yet, anyone who has frequented community-film-group or student-film-series screenings is likely to have seen them, albeit hardly consciously. The images resided among those countdown numbers on leaders – the 10… 9… 8… — and among color-sample bars that audiences weren’t supposed to see, either. 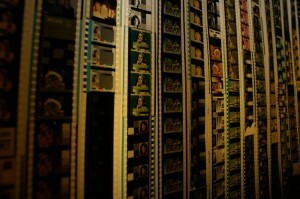 Those should merely have helped projectionists to line up reels to where the footage of the film proper began. But many semi-amateur or inexpert projectionists struggled to make that happen. 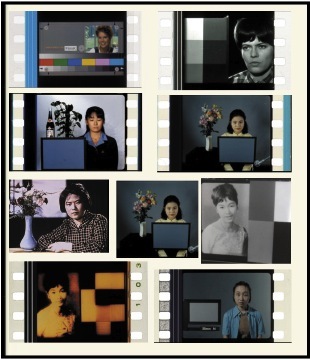 Their audiences saw the preliminary images flashing past; but the China Girls were on just a few frames, so that while viewers might see the countdown numbers, with the film moving at 24 frames per second they were unlikely to register more than subliminally the few frames of women’s faces among the number. Unless the projection stalled even before it got beyond the frames, and burned a hole in them. 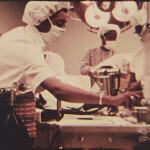 The leader images crafted by various lab workers went out with film reels until the 1990s. 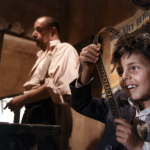 Projectionists and film historians are uncertain about what percentage of reels reached cinemas with the images — some believe most did, or all. It is certain, at least, that not all the China Girls were women — occasionally a child or a dog served. 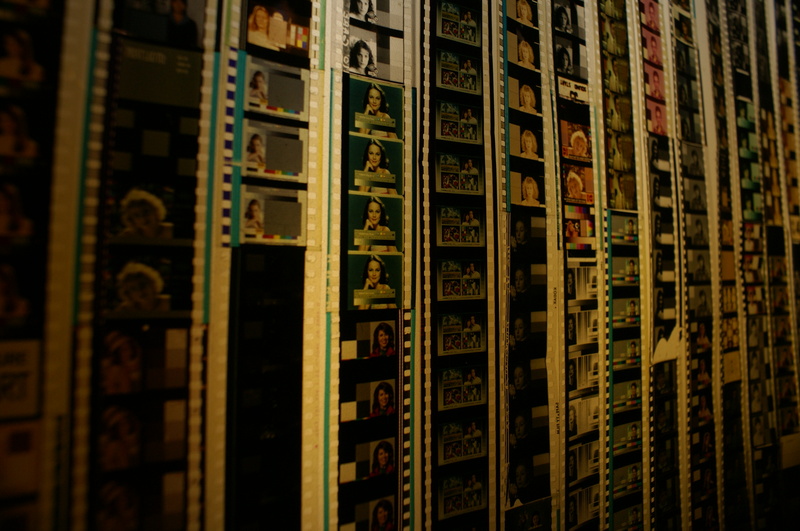 The China Girls/color bar “timing control strips” provided certified, dependable guides for the technicians as they printed film. In the black-and-white era, the human figures combined with tones from white to black to allow techs to produce consistent “black-and-white density” — that, to get technical, relates to the opaqueness of the silver salts and sensitizing dyes that emerge from a film developer. 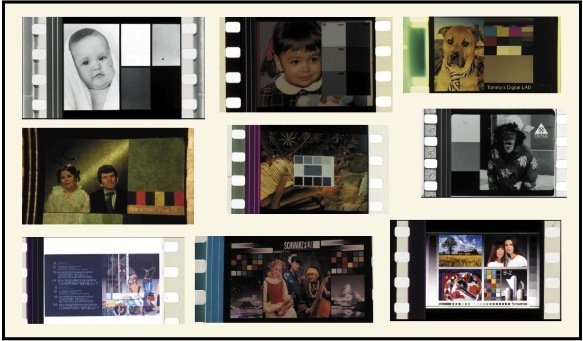 After color became the film norm, the strips assisted in “color timing,” the process of photochemically or digitally tweaking film’s color. The color strips, gray-scales, and skin tones of China Girl figures improved consistency, rather than assured it, because film processing remained a task performed by human beings with subjective eyes. Film director David Lynch has succinctly explained that achieving optimal results was and remains a demanding craft, not readily mechanized. China Girls would have remained curiosities attached to the exacting tasks of film processing, reproduction, and projection had film-lab techs and projectionists not been as given to obsessive collecting as any other group of humans. Once reels reached cinemas, projectionists commonly snipped out their favorite control-strip images which then might become pinups on projection-booth walls. What is striking about the images, in that context, is how lurid they are not. Certainly by comparison with the mugging in, say, Pirelli calendar and “girlie-mag” photos, they do little to indulge the by-now totally busted “male gaze.” Which may well be why experimentalist Guy Madden would stir the pot with his distinctive leader woman (top right). And certainly glamorous results sometimes occurred. To mark and explore this symbiosis of production and collection, aficionados and historians have mounted a few exhibitions, in recent years. The shows have startlingly flipped a facet of film production from obscurity into consciousness by shifting the anonymous models from anonymity to a modest limelight. Pulling the images from the 24-frames-per-second motion of film projection has had an uncanny outcome: many frequenters of amateur screenings report a vague sense of having seen the women before. The images seem to access the buffers of subliminal minds. The Chicago project, like two earlier exhibitions that had museum runs (and generated video essays; see, below), raises the question of why China Girls generally were women. The answer to that is far simpler than discovering the origin of the term: most of those lab workers were men in an industry that lived and breathed glamor. Humble lab techs had no way of persuading movie stars to pose for test strips, so they looked closer to home. Some of their control-strip subjects may have been models or little-known actresses hired for the purpose, but most were clearly lab techs’ co-workers or friends. The Chicago and other exhibitions hardly make celebrities of the women, but do rescue them from fading into irreversible obscurity because reel leaders deteriorate as any nitrate or celluloid film does, particularly as a few frames sliced from film-reel leaders could rarely hope for royal preservation. Karin Segal was then an assistant conservator and publicist at the Harvard Film Archive, and is now program manager at the Docaviv Int’l Documentary Film Festival and managing editor of Maarvon – New Film Magazine, both in Israel; Julie Buck was then head of conservation at the Harvard Film Archive as well as a film instructor and film-series curator, and is now a full-time filmmaker and collage artist. They scanned 70 images into high-resolution digital form and then removed scratches and blemishes that had come to mar the filmed faces and figures. 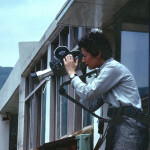 Buck and Segal were unable to find any cases of China Girls-turned-film actress, but used their collection of images to create the short Girls on Film. Soon after came Michelle Silva’s three-minute China Girls (2006). As will by now be apparent, the leader women were not typically Chinese. Ethnicity was not the origin of the term. In fact it has no fully convincing explanation. 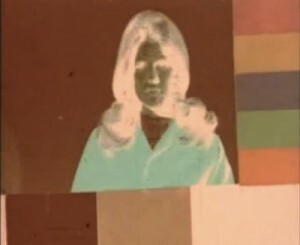 One theory connects the term to a “Chinese-style” colorful shirt that models sometimes wore in the footage. 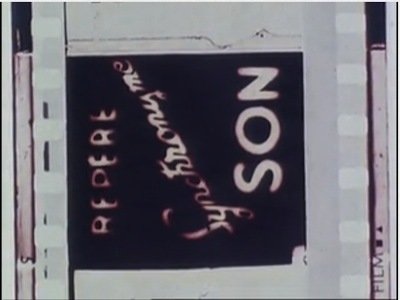 Among other theories is that the term originated with early test frames that featured mannequins made of porcelain – of “china.” Or did it come about because in the pre-sound days of laboratory operations, a lab worker spliced into the leader of a reel of negative film two or three frames from a properly exposed negative from the camera test of a startlet wearing a Chinese straw peasant hat? Some French liliïstes held an impressive exhibition in 2009 titled “L.A.D,” which is the acronym for the Laboratory Aim Density (LAD) system that from the 1980s gradually become a universal standard that made the China Girls redundant (of which more, below). 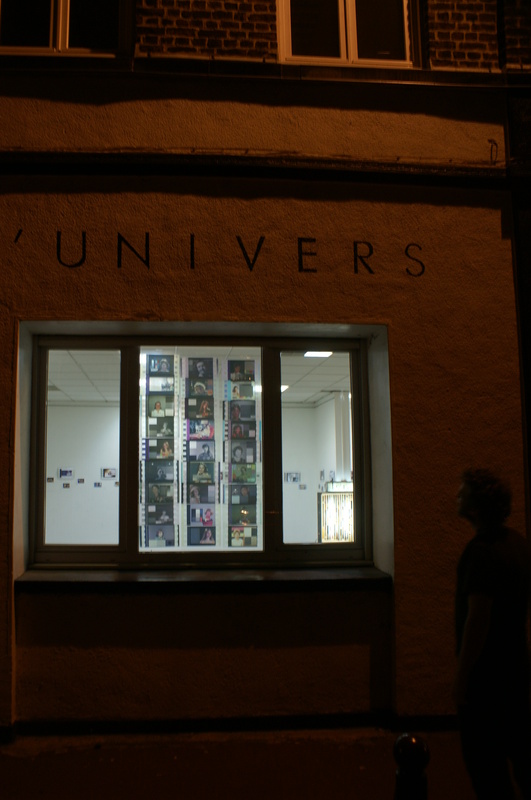 The organizers exhibited about 100 scanned and enlarged “lilis,” from both 35mm and 16mm film, on the walls of l’Univers, a Lille cinema. All four of the short China Girl films already cited concentrate on showing the commonness and variety of the images. Other films have made less extensive, but perhaps more telling use of the device. 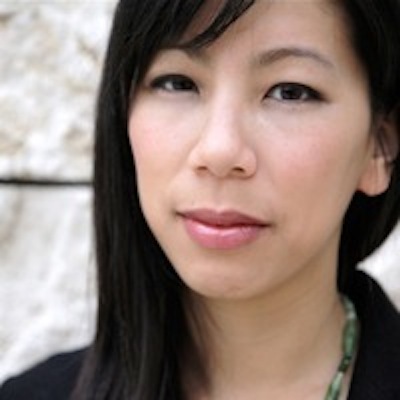 Genevieve Yue, a film historian and theorist at Eugene Lang College, The New School for Liberal Arts in New York, makes presentations of experimental films that raise questions about the implications of the leader woman for film production and reception. In program notes she observes “her essential but often overlooked role in film history has also made her a compelling subject for experimental filmmakers variously examining issues of celluloid materiality, the behind-the-scenes workings of the film industry, and the often marginal role of women.” She proposes that the images, by setting exposure, image density, and color balance, constitute a kind of cinematic unconscious. In Film in Which There Appear Sprocket Holes, Edge Lettering, Dirt Particles, Etc. a 16mm film from 1966, Owen Land (formerly known as George Landow) contends that various “incidental” features of film must be considered as part of the nature and definition of the medium. 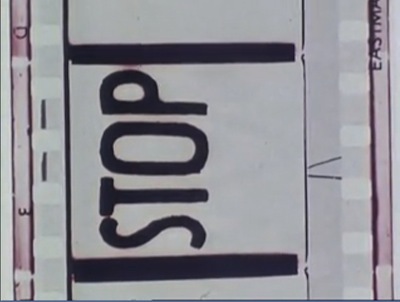 The four-minute, silent, color short includes this visual quip. Click to view “Nadja” by Brian L. Frye. For his “masterwork” Standard Gauge (1984, 16mm, color, sound, 35 min.) seasoned experimentalist Morgan Fisher, while working in Hollywood, snaffled up scraps of narrative features, news footage, advertisements, trailers — whatever he could find in cutting-room trash cans and dumpsters out back. From those he created a sort of homage to scraps of film he has known, but rather than dwell on stars and other perceived key aspects of film, he zooms in on features of film stock that audiences may see, but generally register only dimly. In his flat-affect voiceover, he muses about what bearing they may have on the nature and reception of film. 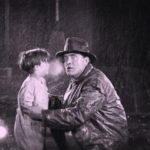 He reflects on why, while a junior movie staffer, he would seek out lengths of film through affection for the qualities for which they were deemed failures, such as errors in timing and color correction. As crafted artifacts, “China” “Girls” have had their day. They no longer grace film leaders. The craft manufacture of leader ladies became unnecessary when their function was assigned to a robotic standardized stand-in, to a simulacrum (as the cultural theorist might put it). As happened to the mechanized looms that the enlightened Luddites sought to clog, alert to their role in ushering in dehumanizing industrialism, the personalized leader head was superceded. In its place came a colored but color-drained leader-for-all-occasions — who won an Academy Award. Renée Zellweger presents an Oscar for scientific and technical contributions to the movie industry to John P. Pytlak, in 2001. 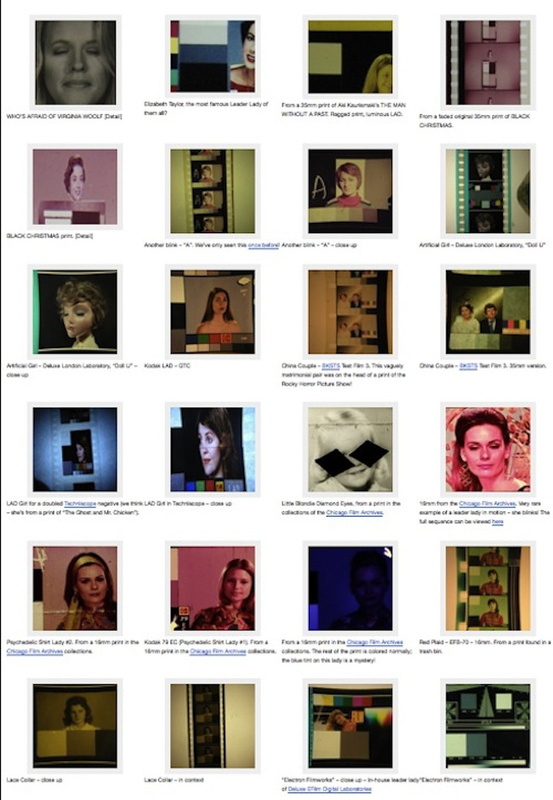 Zellweger explained: “To assist labs in control procedures, there have been several complicated yet useful techniques developed over the years” — she was referring to the test frames of which the China Girls were the distinctive elements, and the color-bars and test patterns were their prosaic companions. 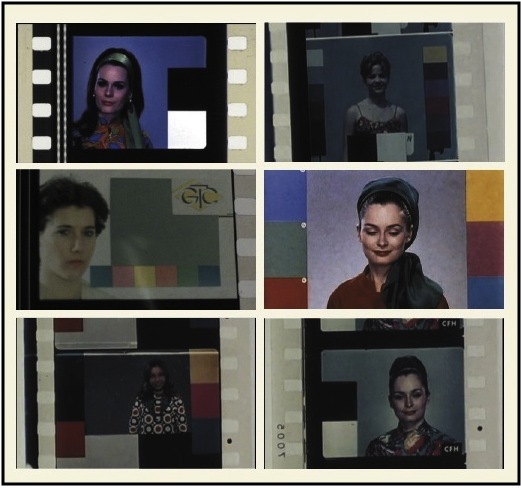 Pytlak explained that in response to the problem Zellwiger outlined — the problem all producers of the earlier China Girls had responded to — he had developed the LAD Girl as a standard control patch for faithful reproduction of color and other characteristics of film. Through the 1980s and into the 1990s, this pretender to the concealed laurel of the China Girl fomented her demise. Figures that had been lumbered with a suspect title to begin with were denounced as “lacking,” despatched to the Tower, and consigned to the status of historical footnote. 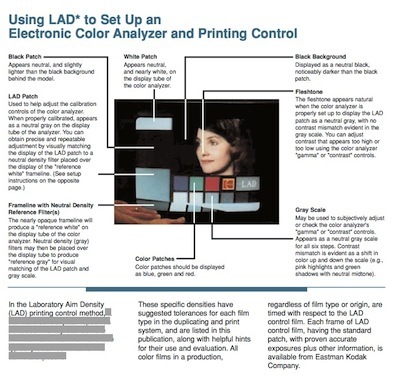 Pytlak, a renowned figure for his technological innovations in film processing, developed his Laboratory Aim Density (LAD) System in 1974 at the Eastman Kodak Company and reified it in 1982 as the LAD Girl that was distributed to film labs worldwide. An explanation on Kodak’s website states its rationale: it “ensures that film that comes out of the lab matches what the filmmaker sent into it for processing.” Hmm… Thoughts, readers? By the 1980s awareness was high of the pervasive rot of gender and ethnicity stereotyping, but while Kodak ditched the “China” characterization of the figures, it oddly did not seize the opportunity to dispense with the colored “Girl” of eight decades; it apparently was indifferent to the obvious irony of disseminating a “lad”-girl, now gender confused as well as infantilized. Every once in a while I’d see one fleetingly as a kid in the early 1960s, but not for a very long time, now. Interesting that unknown women influenced visuals in popular culture for so long, willy and nilly. BTW, I dunno about China Girls-to-movie stars, but the lower right-hand face in the fourth series of pictures looks an awful lot like Ava Gardner; perhaps it was a case of running with what was handy. Vanwall: apparently Quentin Tarantino makes some sort of use of the concept, in one or two of his things including “Death Proof” where he magpies an April March close cover of “Laisse tomber les filles,” a Serge Gainsbourg aptly “you’ll-get-yours-from-a-chick” hit that France Gall topped French charts with in 1964. I guess the China Girl fits well with his tendencies towards self-forgiving indulgence of nostalgia for eras-of-misuse-of-women. Not sure of the details, as that would require watching another of his… films.